Serve up all your favorite hot beverages in this Choice 12 oz. paper hot cup with coffee design! From hot cocoa and coffee to tea and warm cider, this Choice cup is an economical option for your cafe, coffee shop, kiosk, or concession stand. With a poly-coated inside, this cup resists condensation accumulation to protect the outside of the cup from weakening. Featuring a tightly rolled rim, this cup provides worry-free, leak-proof drinking and creates a tight and secure seal when used with a compatible drinking lid (sold separately). These coffee cups are great, but I made the mistake of not buying the cup sleeve and I have had a lot of complaints that they are hard to handle. The only other thing I have noticed is the lids do not go on easily and pop off when you pick up the cup. This cups is exactly what we expected when we ordered it. Great quality paper cup! Customers love the printed color and the fun pattern that makes them come back for more! these cups are perfect, very sturdy and they do not get hot some cups do. we use them at church for coffee ,tea and hot chocolate. In the past I always bought paper cups in brick-and-mortar stores, so was not sure about buying them online sight unseen. But I am happy to report these cups are as good or better quality than those I have purchased previously. The cups are sturdy and leak-proof, even when I microwave water to high temperature for tea. These cups are awesome! I've put extremely hot fluids in this cup and you can still hold it. The size allows for the perfect amount of coffee to boost your energy in the middle of the day. These cups are perfect! Our employees and customers use them for tea, coffee, and hot chocolate. We also use them for our mineral water cooler. It’s great to have cups that work perfectly for both hot and cold beverages. We are very happy with the price savings of buying them by the case. I ordered these cups when the plain white ones were out of stock. They arrived and were just as good and all the lids were interchangeable! Very sturdy coffee cups I used for my do it yourself wedding. Great price for the amount you receive! I have bought multiple things from this company! I use the 12oz cups for small coffees or homemade hot chocolate. They keep the items very hot for a long time. Great product and easy to pop on a lid. Very good quality cup and I use for both hot coffee and iced coffee. Very sturdy cup and next time I will get the one that comes with lid. These cups are the perfect size for coffee and tea. I would suggest that if you are buying these cups, you also buy the matching sleeves, as the cup gets quite hot on the outside. Other than that I have no complaints - the price is reasonable and the design is quite appealing to our customers. I have customers who buy this product by the case. They love the design and have not had any problem with leakage. Why spend more? A lovely café inspired paper hot cup that looks great and is perfect for our social meetings. The 12 ounce size is our go to for coffee and is the perfect size. This product is perfect when you need your coffee on the go! The 12 oz. Coffee Print Poly Paper Hot Cup keeps coffee warm and protects hands from the hot heat! It also has a rolled rim to help the lid stay on and has a nice pattern on the outside of the cup! 12oz coffee print poly paper hot cups are just so nice and stylish. The quality is just outstanding. They don't melt and keep the liquids hot for a very long time. These Choice cups are good quality, however we are not the biggest fan of the design. We much prefer a white cup. That being said, these cups could work great for an office or cafe. It was just not our style. These cups will work well for coffee and other hot beverages. If the beverage is extra hot be sure to use a sleeve. Attractive design and durability with these 12 oz. Coffee cups. Very good price compared to the big brand names but just as good or better. Very pleased with the product. I found the Choice cups to be a good choice for us. The price is fair and the cups look good. We currently use 12/16/20/24 oz. cups I have not been able to find a 24 oz. cup in the Choice variety so I am forced to buy that size from another company. Hopefully they will expand the line to include 24 oz. soon. The only issue I have with the cups are the ounces are on the bottom of the cup in small print. You can't really look there when the cup is full. I would like to see the ounces visible on the outside for both the customer and the cashier. Overall a good choice. These are our go-to to-go coffee cups. They're cute and sturdy, even though they're paper. We serve both hot and cold drinks in these cups because we don't like using plastic, and the condensation on cold drinks will weaken the cups a bit, but not nearly as bad as the old paper cups we used to get. These are much more durable. The one complaint is that, almost every row, the cup at the end is slightly dented along the rim and sometimes the lids won't fit securely and we have to throw out that one cup. Love this cup! I use one every morning to drink my coffee out of. Appealing design, extremely sturdy, and keeps my coffee hot for an extended amount of time. The cup doesn't sweat or get soft from the liquid if I don't drink my coffee right away! This cups are cheap for a 1000 case the lasted me a month before I had to order more they are also stylish to. They keep the coffe warm. These paper hot cups are made of a quality thick paper. Their colour is catchy and cute. I have four sizes of them 4oz for Espresso and 12oz, 16oz and 20oz for regular coffee, latte, cappucino, all other hot beverages. great 12 oz coffee cups with thick poly paper so customers can't burn your hands. Which is great for customers on the go. Well liked by customers and employees. These hot cups are just amazing. They are the perfect size, especially for an office where there are lots of people and everyone has their preferences. I would recommend to anyone looking for THE hot cup. Regular coffee cups, great design. The only issue with sinking. After 2 hours of standing on the table, we've noticed some spots underneath. Good choice if you prefer to save some money. These cups are perfect for my small coffee shop business. Great quality, not flimsy, and hold up to hot and cold liquids. The colors however are more of an orangey brown instead of a dark brown and light brown. These are our go-to coffee cups for our office and warehouse! We've used them for a few years now, and they get the job done with class. They're located right next to our Keurig machine, in an accessory/condiment holder. First class, and practical. The Choice Coffee Hot Cups are strong! They hold up with all kinds of hot beverages and they are so easy to use. We use them often when entertaining and we always get compliments on these cups. I would recommend them. This is the first time I've had these cups. They are a great durable cut for the price. Had customers reuse them numerous times and still didn't break. No damage to any of the cups. Worked great with coffee. Didn't feel hot or burn at the touch. Love the design on the cups. This cup holds up great when using it for a variety of hot beverages. It keeps drinks hot and doesn't burn your hand. A great inexpensive option. These cups are great. We use them for coffee, hot tea and hot chocolate. They hold up well, the printing is nice. I consider this to be on the smaller side of coffee cups if you're going to have 3 sizes to choose from. We wanted a nice looking, affordable coffee cup for our small coffee business in our store. We really liked this print design and got the matching sleeve. The price and selection was great even though we only needed 2 sizes. These disposable 12oz hot cups have print on the side. These are great cups that can withstand some heat from your hot beverage you wish to travel with. At this price you can't go wrong. Used for our medium coffee, this cup has s cool design with different coffee drink names written on it. Keeps warm beverages warm for a while. these 12oz cups are just perfect for coffee. they are very durable and i have even reused them a few times. they are well worth the price and its a great deal. We run a small craft buisness from our home so we like to have coffee out for our customers when they stop in. It's nice to have a variety of sizes to choose from. This is a great quality product. It doesn't get soggy like other paper products that you buy in your local stores. We will continue to purchase these. This is our most popular size cup. The brown and yellow design is actually very visually appealing, and hides splashes of coffee that you might get while pouring. These are a good look at an affordable price. If you don't go through a lot of these, bundling these with your other orders is a great savings. We have been ordering these coffee cups for years. It has a clever design and fits nicely in any holder. You never have to worry about leaks when using these cups. Excellent paper cups for hot beverages. Sturdy, not flimsy. A must have in our coffee/tea bar. Don't forget to buy the matching lids from webrestaurant.com as well. Will definitely buy these again! I love these cups I ordered some for the house and when im on the go and then for my babies bday party. They look fancy are thick and I love that it is paper and not styrofoam. Such a great price too. Nice 12 ox hot cup. perfect for coffee or tea. has a good feel and beverage stays hot longer. Will order again with matching lid. I purchased these for our break and conference rooms. They look nice and have a nice feel. Very sturdy, as all hot beverage cups should be. We bought these and matching lids. Either cups or lids, or both are defective. The lids don't fit the cups and fall off. We throw away several each time we need one to find a cup and lid that half fit. I will never buy these again. Thanks for reviewing these cups, Lee. We apologize that these are not fitting well with their matching lids. A Customer Solutions Representative has applied these as a credit to your account. I buy these cups time and time again. 12 ounces is good but next time I will probably go for the 16 ounces because I use primarily for coffee. Great product, works so well to keep hot drinks hot and cold drinks cold. I used it mainly when serving coffee and have not received any complaints. These were my favorite cups when we first opened our shop! Customers knew from a glance which of their friends frequented our shop. Great price too! Employees at our company prefer to use this cup for hot beverages. The drinks stay hot longer and we can hold onto the cup without burning our hands. Nice cup-they get hot so don't forget to buy sleeves-even with the sleeves, they are still hot. I like that they aren't styrofoam and are made from recycled materials. We purchased Zchoice 12 oz. Paper Hot cup with Coffee Design - 50/ pack to accompany the insulated coffee dispenser we also purchased. Holds hot liquids wonderfully. Guest lived the color Aldo. We will purchase more! We use mostly our suppliers coffee cups, but sometimes we run low and these work as a great substitute for our coffee products. They are much better than just white cups or others because of their cool looking graphics. If you need something that works well and doesn't cost a lot, these are a great product. We haven't had any issues when we use them. The 12 oz size here is great for those morning customers looking for a coffee on the go. Great product , nice color and the look of this cup , great for my business will be getting more very soon is just what I need it ! We used these for an outdoor event in the fall for hot coffee and hot apple cider. They added a nice bit of "class" without ordering/spending money on a custom cup for our event. We like this size cup for that quick cup of coffee, it is strong, travels well and also microwaves well. The bottom holds up well to several refills. We like this cup a lot. A great product all around. Love the graphics and the construction of this cup. Sturdy and doesn't bend when held tightly. A very appealing design. These have to be the best hot coffee cups out there..I used to carry the solo brand cups at my store, but since I put these out for use just 2 days ago, customers have had nothing but complimentary and great things to say about these cups..sadly I havent yet received the webstaraunt lids to go with it, but when they do get here im sure the cups and lids will make a combo that can't be beat, especially with Ethiopian yirgacheffe and Guatemalan coffee beans that are grounded fresh daily.I will have the best of the best coffee wise .. I love the sophistication of the cups design and the price is cheaper than the plain white also. You cant beat that. The only down fall is that because it is a paper cup, you cant really microwave it for over a minute without it getting burnt. We bought this hot cups to use for guests to our office: new employees, vendors and the like. But they were so popular that our employees began using them. Now Choice 12 oz. paper hot cups are our cup of choice. They are perfect for us. These cups are so cute and a much cheaper alternative to bulk store coffee cups. Use them at home and in our restaurant. Very sturdy, don't get soggy quickly. Thank you for your review! We are sorry that the cups you received were not correct. A Customer Solutions Representative will be contacting you shortly to add these as a credit to your account. These cups are really sturdy and look nice. We are using these for coffee and hot beverages. We also use the lids with these and cut down on spills! I am ready to order these again. I get quite a few compliments on the design. It would go well in any coffee bar. I feel the cups are sturdy and hold liquid well and don't leak. I cant say enough good about Choice brand products. 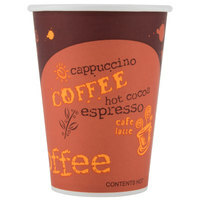 These 12oz paper hot cups are very good quality and a great price. The design is much nicer than the plain old white. This size paper cup is perfect for medium roast k cup coffee. I like design and quality. You do not feel hot. I will order again. Pros - Very sturdy for a paper cup and a good price. The only con would be that they can be quite hot to the touch for some customers. We've had good luck with them thus far and will likely order them again when we need to restock. Good paper hot cup... make sure you use the lid and push down or else it won't stick. Can't complain for the price once you get the strategy down. Careful! I like these cups especially for the price! We use them with the black lids and the sleeves. I tested one with putting our keurig coffee in it. I was able to hold it and put it down on a table without being burnt without using a sleeve. Added the sleeve and I could easily hold it for however long without being to warm. These cups are great! The color and design are very nice and they are very sturdy. They are the cheapest I've found anywhere so far! We had purchased Styrofoam cups previously but the waitresses didn't distinguish what sizes for take out coffee and cappuchino resulting in loss of profit for business. Easily identifiable and reasonably priced. We have used the Choice cups every since our company has become "Green". These cups are the most economical ones on the market. Great quality cups for hot or cold beverages. I would recommend using a sleeve for hot beverages, though. We love these cups! Our clients evnjoy them too , Pretty and sturdy. They are easy on the hands too, with hot liquids being dangerous. The perfect medium size, with a design that is noticeable but tasteful. The price is great, and the sleeves are convenient. We use with black lids. These are great coffee/hot beverage cups that no one has yet to complain of burning their fingers. I would recommend these for use at any event. We love these 12 oz coffee cups. They stand up well with hot coffee in them and we think they are cute, too. We would recommend them. Our customers absolutely LOVE these cups! They are a great conversation piece and help to quickly identify our shop! We were a bit nervous that the material would be too thin, but they are as thick if not thicker than cups we have payed much more for! Note, while these cups look red, they are actually a salmon/pink color. Great value for money and helps to increase sales. The designs are very appealing to customers which results in a boost of slaes. Great for keeping drinks warm too. Great coffee cup for customers when your on a budget! I will be buying these again for they seem just as good as the name brands out there. Who ever packs these should make sure they are the 12 ounce instead of ounce cups when shipping them though because I got one 16 ounce ream instead of a 12 ounce! Excellent and cheap paper cup for coffee! I chose this cup because of the price. I use Guatemalan coffee at the shop which isn't cheap and a lot of the people in my area don't want to pay much for a cup of coffee, so I went with this as a method to keep the costs down. VERY satisfied! The look is very sharp and modern and has the feel of a more expensive paper hot cup! Will definitely reorder! Very sharp looking with the lids on as well! These coffee cups are extremely thick and I find them very durable to use. The inside has a wax layer to repel water and coffee to prevent leakage. Our coffee costs are cut in 1/2 using the cups through Webstaurantstore.com. They are strong, hold up to the tempurature of the coffee! We are very pleased with our change in coffee cups. Thank you for submitting your review! We recommend using these cups with the eco-friendly 500COLLAR coffee cup sleeves. These hot to go coffee cups are a great way to take coffee on the go. It holds twelve ounces and keeps the coffee hot for hours. I love these cups. They serve as our small size for coffee and they are the perfect amount. The design on the outside is very nice as well! Webstaurant is an excellent, well-priced site! These cups look and feel quality, I have looked all over the web and these are the best price for your money. I always use this website for all my shop needs. This is a nice thick cup. We often don't need a clutch for these since they are so think. The only challenge we have is they do not use a universal lid. 12 oz cups , what can i say the , the quality of these cups are far more than i expected. the constuction of the cup can withstand any hot fluids ,coffee, soup,ect. the order came just aas they said. well order again. These cups are perfect for my new cafe. Cute design and warm colors when it's cold outside! I ordered these cups specifically from Webrestaurant because they were the best design in my search! I sampled these before I ordered a large supply and they worked great! The price was just right and I saved money. I have cut my expence with out compromising quality for my customer. Great cor to go coffee and tea. The cup is very sturdy and fits nicely ith most coffee cup sleeves. The cute design is perfect for our shop. This is very attractive cup, customers always give compliment. I can not see serving hot coffee, tea or any hot beverages without this cup. I love it and will buy again.